Gunn systems provides custom hardware design solutions for your microprocessor controlled designs. Our design staff can meet your needs for digital and microprocessor based design from quick turn prototypes to full scale production, and we can do it quickly. We can take an idea for design from concept to reality and work closely with the customer through out the process. Our staff has extensive experience designing microprocessor based products. Added with our ability to do PC Board Layout and Embedded Firmware in-house, this allows us to provide a highly integrated design service that can make your design a reality very quickly. (In-Car PC) For Portal Media's Co-Pilot™ product, Gunn Systems developed the custom hardware and software to bring the PC to the mobile environment with all the features required for automotive entertainment, navigation, communications, and safety in one device. In-Dash Co-Pilot™, for entertainment, navigation, communications, and more. Co-Pilot™ Prototype. LED Lighting System The Star Panel™ from Impact Lighting, Inc. brings the look of the nighttime sky to the indoors. Gunn Systems was contracted to provide a redesign, enhancing this product and reducing production costs. The AMS Model Lighting Controller Interface. One of the models in action. The WAASP vehicle-mounted weapon system. Camera and Machine Gun mount. 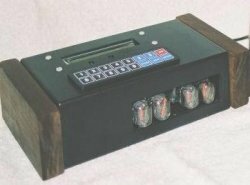 Pool / Spa Controller Gunn Systems developed this controller for the Pool/Spa industry. The device is used to control a circulation fan, and provides features such as wave simulation and advanced timing functions. Closeup of the PC Board and Interfacing. The Controller with its Remote Interface. Robotic Trash System Gunn Systems was brought onboard to bring this invention (by Automatic Trash Can, Inc.) from design to reality. Gunn Systems designed the controller electronics and firmware, and developed custom hardware and firmware for the TrashRobot cart. The Trash Controller, developed by Gunn Systems for ATCI, allows for scheduled delivery of trash from the home to the curbside. Gunn Systems was responsible for bringing the second generation of the Bio-Pump® to market. The second generation was cost-reduced, and several enhancements were added to the design. Development included taking the design from through-hole technology to surface-mount technology. Gunn Systems also refined and optimized the firmware design of the product. The Zefon Take-4™ Countdown Timing Controller was designed to be the easiest timer to use for controlling 1-4 air sampling pumps simultaneously. Gunn Systems provided the product design services, from concept to production, excluding packaging, which was provided by the customer. The Volumizer® Gunn Systems provided hardware design services to a major performance automotive parts retailer to develop the VOLUMIZER, a modification kit for 2003-2004 Dodge Ram 5.9 liter Cummins that provides maximum power and torque without compromising reliability. The case is lightweight aircraft quality aluminum. The kit allows its owner to switch from the stock Dodge setting to 60 or 100 horsepower programs while the vehicle is running. Intelligent Battery Tester Gunn Systems provided PC Board Layout services for a major tool supply company to develop this Intelligent Battery Tester unit, which features a testing method that does not require the battery size to be entered into the unit. Features include LCD numerical readout (showing percentage of battery charge), LED Bar Graph Display, detection of bad cells, and other LED indications. VMS Controller PC board and design for control of Variable Message Signs. Utilized off-the-shelf embedded PC microprocessor with custom packaging and front panel design. Gunn systems developed PC board, hardware design, and firmware design. System communicated on 4 serial ports and monitored over 200 I/O points. Developed a working prototype of an Inkjet printing device for painting fingernails. The system involved design and development of an embedded system using the 68HC08 microprocessor to drive a proprietary printing platform. Gunn Systems developed the hardware, PC board, and firmware programming to control the printer. For more information on the device, click here. The End Result Produced by the NailJet. For those enthusiasts interested in vintage electronics, Gunn Systems developed the Nixie Tube driver board and clock. The integrated driver board allows easy connection to a microprocessor system via the SPI bus. On board DC-DC converter supplies the high voltage to drive the Nixie Tubes, and the board only requires +12 V DC supply. Great for retrofitting vintage Nixie Tube clock displays, or new retro designs. The Nixie Tube Driver from Gunn Systems. Nixie Tube Clock by Gunn Systems. Move your pointer over the image for a look inside. Controller to monitor Underground Storage Tanks. 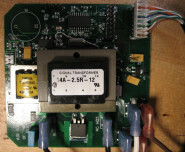 System uses custom developed controller using 68HC11 microprocessor. Finished Boxes, Ready to be Installed. Developed proof-of-concept prototype for a small vending machine type controller for quick oil changes. System utilized off-the-shelf hardware with custom packaging and firmware. ...and many more. Contact us for further examples of our work. Circuitronics - PC Board Manufacturing and more. Part Miner - An extensive part lookup database. Jameco - A good source of electronic parts. Bowden Hobby Circuits - A circuit Archive site. Aaron Cake Circuit Archive - Mostly simple circuits. Dr Bob's Circuit Archive - More Simple Circuits. Tomi Engdahl Circuit Archive - A good archive of various circuits.